Vladimir Putin and Sergei Aksyonov, Feb. 20, 2016. 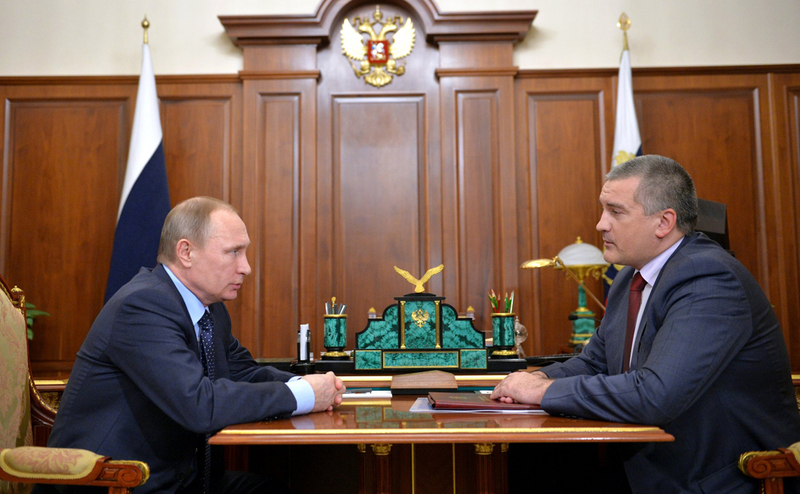 Putin met with Crimea head Sergei Aksyonov on Feb. 20. The second phase of a power bridge to Crimea might be put into operation ahead of schedule, Russian President Vladimir Putin said. Aksyonov briefed Putin on the efforts being made to launch the power bridge's second phase as soon as possible, mentioned positive dynamics in the process, and assured him that Crimean residents would be able to put up with planned rolling blackouts before the power supply line becomes fully operational. "It's necessary to wait a little bit more, I think our colleagues will certainly make it by May 1 or perhaps sooner," Putin said. Aksyonov said the Crimean administration is maintaining contact with the Energy Ministry, and the work on the second phase of the power bridge is going virtually round the clock. He pointed out that an emergency situation has been in effect in Crimea since November 22, 2015 because of "a terrorist attack committed in the neighboring state." "Nevertheless, despite the fact that Crimea has been de-energized, the terrorists' and the Ukrainian leadership's plans have failed. The Taman-Kuban power bridge was put into operation three weeks ahead of schedule. The schedules have been drawn up as of now. Residential areas have been disconnected [from power supply] for no longer than eight hours. At the same time, all industrial enterprises are working, and the plans have been coordinated with regional staffs," Aksyonov said. The overall damage and direct losses of commercial companies from the state of emergency have reached 480 million rubles, Aksyonov said. The Crimean budget has allocated 540 million rubles on fuel for diesel generators, their servicing and consumables, which is "not critical for the republic's budget," he said. "At the same time, industrial production in the republic has grown by 12 percent compared to 2014. For the first time in seven years, this growth can be attributed primarily to the food industry, which grew by 36 percent. As for the agricultural sector, 1.3 million tonnes of grain crops was harvested, which is 14.5 percent more than in 2014," he said.